"Sampath Speaking" - the thoughts of an Insurer from Thiruvallikkeni: Panama leaks .... Pathankot probe - the real and fake !! Panama leaks .... Pathankot probe - the real and fake !! It is unlikely that this 41 years old leaving office “for an unspecified amount of time,” would be read with interest in India, but it is …. Iceland is a Nordic island country between the North Atlantic and the Arctic Ocean. It has a population of 329,100 making it the most sparsely populated country in Europe. The capital and largest city is Reykjavík. Reykjavík and the surrounding areas in the southwest of the country are home to over two-thirds of the population. Iceland is volcanically and geologically active. Iceland became independent in 1918 and a republic in 1944. Iceland's prime minister resigned Tuesday, becoming the first political victim of a mushrooming worldwide scandal over hidden offshore financial dealings exposed in the so-called Panama Papers. 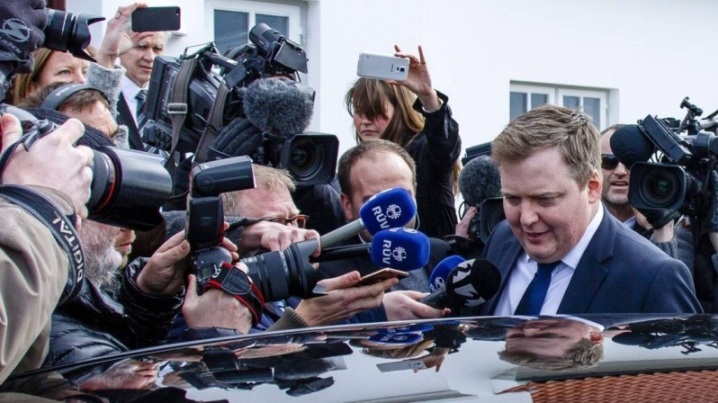 Prime Minister Sigmundur David Gunnlaugsson was the biggest casualty of a worldwide media probe into 11.5 million leaked documents that purportedly reveal the offshore financial activities of 140 political figures, including 12 current or former heads of state. A series of other leaders and stars fingered in the leaked papers have hit back at the allegations, denying any wrongdoing despite the international furore. Those named include Russian President Vladimir Putin's associates, Chinese President Xi Jinping's relatives, British Prime Minister David Cameron's later father and celebrities such as Argentine footballing great Lionel Messi. Iceland's leader had been under immense pressure after the papers, leaked from a Panamanian law firm, appeared to show that he and his wife Anna Sigurlaug Palsdottir owned an offshore company in the British Virgin Islands and placed millions of dollars there. Though the prime minister denied ever hiding money abroad, pressure on his government had mounted, with egg-throwing protesters gathering in the streets Monday and fresh demonstrations planned Tuesday. The vast stash of records from Panamanian legal firm Mossack Fonseca was obtained from an anonymous source by German daily Sueddeutsche Zeitung and shared with more than 100 media groups by the International Consortium of Investigative Journalists (ICIJ). Australia, France and the Netherlands have announced investigations into revelations contained in the papers. A judicial source said Spain had opened a money-laundering probe into the law firm. Panama has pledged to identify whether any crimes had been committed and any financial damages should be awarded. Back home, Bollywood megastar Amitabh Bachchan, whose name figures among 500 Indians in the Panama Paper leaks as allegedly having links with offshore entities in two tax havens, on Tuesday denied any connection with those companies. Amitabh Bachchan reacted saying his name may have been misused, reports The Hindu. Responding specifically to The Indian Express led reportage, Bachchan said: “In any event, the news report in Indian Express does not even suggest any illegality on my part”. Apart from Bachchan, some others who have spoken up after the expose are saying that their investments abroad are within legal boundaries. The Indian Express carried a report on Monday based on leaked documents of a Panama-based law firm Mossack Fonseca which is said to feature links of over 500 Indians to firms and accounts in offshore tax havens. Referring to the report, Bachchan, 73, said, “I do not know any of the companies referred to by Indian Express—Sea Bulk Shipping Company Ltd, Lady Shipping Ltd, Treasure Shipping Ltd, and Tramp Shipping Ltd. I have never been a director of any of the above stated companies. It is possible that my name has been misused. Moving away from money to life or actually death – there was terrorism at Pathankot and for reasons best known, there was a Pakistani JIT probe. Now days after the Pakistani Joint Investigation Team (JIT) probing the Pathankot terror attack admitted that the four terrorists who attacked the Pathankot Indian Air Force base were from Pakistan, yet the JIT said that the Pathankot attack had been staged by India, according to a Pakistani media report. It is reported in Pak Press that JIT report, which will be submitted to Pakistan prime minister Nawaz Sharif in the next few days, has even concluded that Indian authorities had prior information about the terrorists. The report also quoted a member of the JIT as saying that the NIA officer's murder on Saturday night in Uttar Pradesh showed that "Indian establishment wants to keep the matter under wraps." "The Indian authorities made it a three-day drama to get maximum attention from the world community in order to malign Pakistan," Pakistan Today quoted the JIT report as saying. The source also told Pakistan Today that no "major" damage was done to the base and that the perimeter lights at the airbase were not functional on the day of the attack, which apparently raises questions about whether India had prior information about the terrorists. This is not the first time, though, that the Pakistani media and the JIT have made allegations of hiding evidence against India. What is truly surprising about the Pakistani JIT report's claim is that it comes just days after the same JIT admitted that the terrorists were from Pakistan. Reports had, in fact, also suggested that Pakistan had enough evidence to link them to extremist group Jaish-e-Mohammad. In an unfortunate accident, a member of Pakistan’s Joint Investigation Team investigating Pathankot terror attack died earlier today. He died after he fell off the mountain of evidence India has provided regarding the Pathankot Airbase attack. A Pakistan Army spokesman revealed this shocking news to the media personnel at a press conference in Islamabad. “Our JIT was doing their regular duty of making paper planes out of the evidence India had provided when this unfortunate accident happened. Usually India sends a couple of dossiers of evidence so it was easy to just dump them in the garbage bin but this time there was so much evidence sent by them that the pile of dossiers became as high as a 7 storey building. Like thorough professionals, our team was on top of things and then our brave officer’s foot slipped and he fell to his death”, said the Pak Army spokesman. Meanwhile, Pakistan Government has instructed only trained mountaineers to work on the evidence provided by India for 26/11 attack, currently the second highest mountain peak in the world.